Back in September Crain's ran a story about how downtown Chicago condo prices had returned to peak levels. Their conclusion was based upon data from a pretty reliable source: Appraisal Research Counselors, who looked at more than 65 different condo buildings in downtown Chicago. ARC pointed out that within 65 buildings prices per square foot were within 4.3% of their 2008 peak. I think they were looking at prices for the first half of 2014. Let me point out that ARC was looking at Chicago condo prices per square foot, something that a pack of appraisers jumped on me for in a previous post about bad appraisals. Anyway, I've seen so many underwater condos - even now - that I had to look at some of this data myself. Not to mention that I have a hard time believing data if I haven't seen it myself. 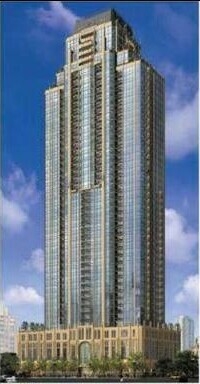 I decided to start with a premier building - The Pinnacle at 21 E Huron. And, yes, I looked at prices per square foot. But I'm reluctant to use averages because averages lose all the individual nuances. Therefore, I took all the Pinnacle sales from the beginning of time and dumped them into a scatter diagram over time so that we could see the distribution of individual sales. I also flagged all the large 04 units with red squares since these units carry a premium per square foot because of the view and the floor plan. You can see the pre-construction cluster of sales at the very beginning. Those occurred at some discount to later sales. Then prices started rising until very recently. 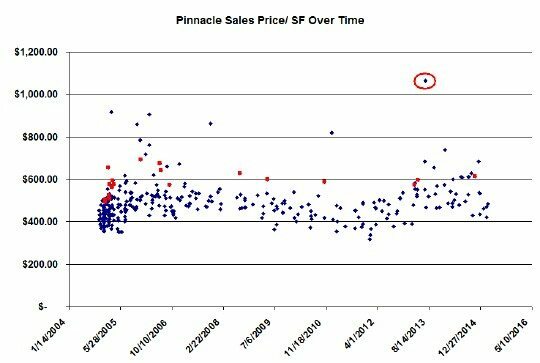 The most recent sales seem to be at lower prices/ sq ft but there are too few data points to really draw that conclusion. The total decline in pricing at the Pinnacle seems to have only been about 20%, whereas Chicago condo prices fell by 40% on average from peak to trough according to the Case Shiller index. So a premier building like this didn't fall as much as the average to begin with and didn't have as much ground to recover. One other interesting side note...see that outlier I circled in red on the graph? I've previously written about that penthouse unit, which was sold above $1000/ sq. ft. by an extremely colorful couple, and was totally pimped out so to speak - very tastefully though.